With the changing of the season so obvious where I live – especially the beauty of the leaves on trees turning yellow, orange, red and brown amongst the greens, the cycles of nature are front and center in my mind. Also, water has been on my mind. There is the melting of polar and glacial ice, the appearance that storms are increasing in their intensity, drought in some areas leading to large and intense wildfires and just having enough clean and safe drinking water for the burden of humanity. For too long, humankind has treated the Earth as though it was a supermarket of resources to be tapped, extracted and exploited for profitable gain and usage. When I was growing up in the El Paso TX desert area, the Rio Grande always had water flowing. One year not too long ago, there was only dry river bed. Because Nature is not static, water levels are always changing. The amount of snow in the Colorado Mountains in winter or the release of excess water by the Mexican government preparing for “flood season” can greatly change the flow of the Rio Grande from one year to the next or from one week to the next. In my early adulthood, I once saw a girl drown in that unpredictable river. On our own farm, the farm pond and beaver ponds can be full and overflowing in Springtime and dry and minimal this time of year. These are all reflections of the natural cycles of nature and water and we would do well to learn to understand them and cooperate with them, rather than fighting against nature or polluting the little fresh water the planet actually has available. We are a “water” planet which is crucial to all of life. Water makes up about 71% of the Earth’s surface, while the other 29% consists of continents and islands. However, 96.5% of all the Earth’s water is contained within the oceans as salt water, while the remaining 3.5% is freshwater lakes and frozen water locked up in glaciers and the polar ice caps. Of that fresh water, almost all of it takes the form of ice: 69% of it, to be exact. If you could melt all that ice, and the Earth’s surface was perfectly smooth, the sea levels would rise to an altitude of 2.7 km. For those like me who don’t do metric easily that is a rise of almost 9,000 feet or over 1-1/2 miles. Wow !! The amount of water that exists as groundwater, rivers, lakes, and streams is only a little over 0.7% of the planet’s total water resources. It is a much rarer and more precious commodity than most people are aware it is as they flush their toilet, water their yards and fill up their drinking container. Water has many forms which most of us are intimately familiar with — rain, hail, snow, ice, steam, fog and dew. Even though the minerals in salt water are harmful to most land plants and animals, it is from these vast salty reservoirs (the seas and oceans) that most of our precipitation (rain, snow, etc) rises up to form clouds and comes down upon the land and flows back into the ocean again. 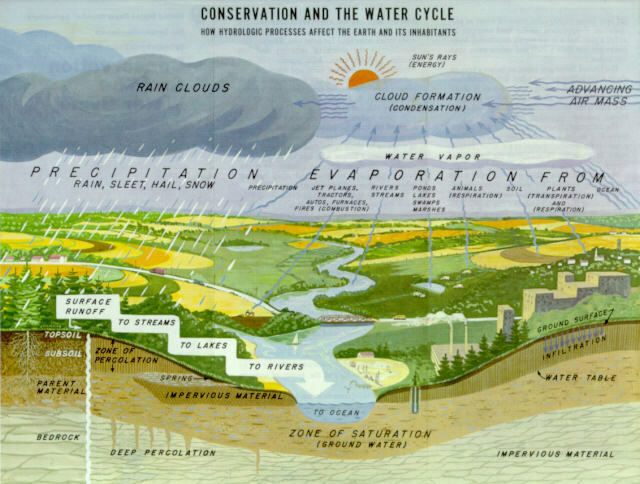 The water, or hydrologic, cycle never ends. That is a good thing. Each person needs about a gallon a day for drinking, cooking, and washing. 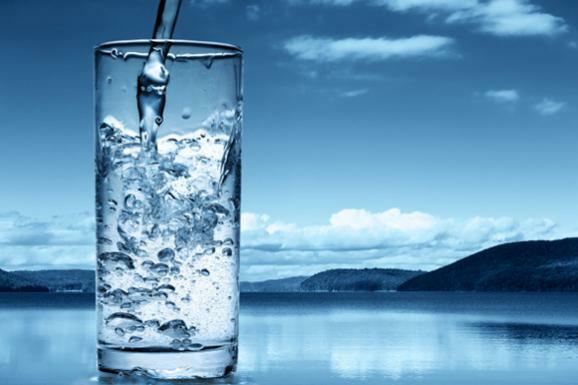 The average water usage in medieval times was no more than 3 to 5 gallons a day per person. Presently in the United States, people are using about 1,500 gallons a day for their needs and comforts which does include recreation, cooling, food production, and industrial use related to their existence. Another Wow !! I have been aware for a long time that there are concerns about enough fresh water for the planet’s growing and evolving population. Long ago, Leonardo da Vinci acknowledged that water is the driving force of all nature. In many places on this planet reservoirs and aquifers are drying up. Currently, one in seven people on the planet lacks access to safe drinking water. In some places in the Middle East water has become more important than oil and governments invest in desalination plants. Up to 75% of the farmers in the hot dry plains of northern India, eastern Pakistan and Bangladesh intensely irrigate their crops with pumped groundwater and their use of that water is intensifying. So what can be done ? As far back as 2010, 1200 leading international experts from 80 different countries came together and created a list of 19 partial solutions to the Freshwater challenges facing humanity. Of course raising consumer awareness and teaching how to make better use of limited water resources tops the list and is why I am writing a blog about this today. I always seek to be part of “the solution” to whatever concerns me rather than part of the “problem” which only leaves one mired in disfunction. Wastewater treatment is an obvious place to conserve and revitalize the water that exists. Advanced technologies for cleansing wastewater continue to progress and develop refinements. Clearly agricultural and irrigation practices need rethinking. 70 percent of the world’s freshwater is currently used for agriculture. Water needs to be revalued at higher prices which would reduce waste and pollution. One way to conserve fresh water is to improve the catchment of water running off paved surfaces in urban areas. Good water management takes into consideration the whole ecosystem – sewage treatment plants could be operated in partnership with clean energy producers who use the wastewater to fertilize algae and other biofuel crops. Those crops, in turn, have an ability not only to soak up nutrients but purify the wastewater which can reduce pumping and treatment costs. Yemm & Hart’s Origins Material uses recycling water that is heated and sent through piping to melt the recycled post-consumer plastic flakes and pellets loaded into the trays of our press. Then, recycling cool water is sent through pipes to set the material into the patterns that make Origins unique. 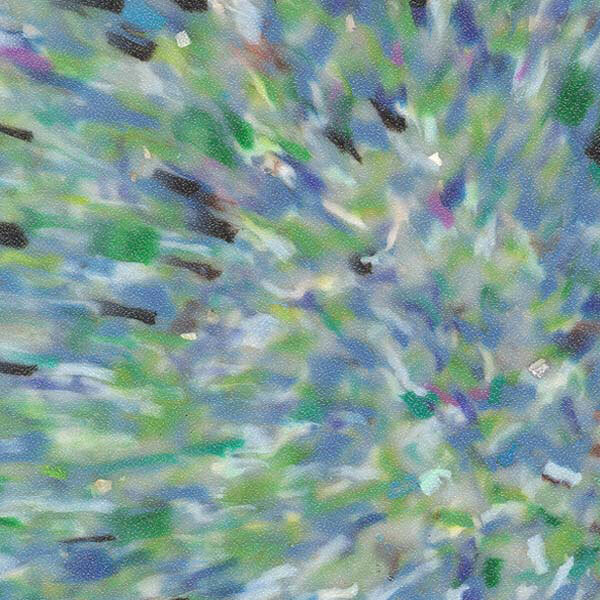 It is the melting flow of plastic which then is “frozen” into place that gives us a random and natural patterning effect. What’s new with the most “ECO” of all materials ? (Yeah, I’m talking WATER) I believe that what’s new is a developing but radical change in humanity understanding not only the precious nature of this natural resource but regarding each person’s role in conserving and protecting it’s life sustaining qualities. Think about it the next time you take a thirst-quenching drink of pure, clean water. It is often hard for environmentalists to love plastics. A realist however knows that plastics are here to stay. 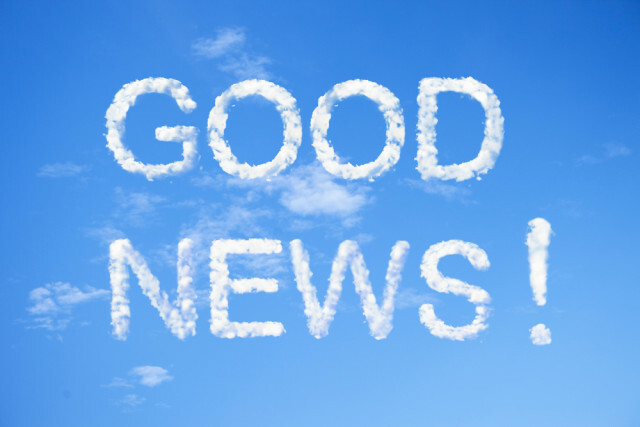 Lately, I’ve become aware of several pieces of “good news” for plastics thanks to the publication known as “Plastics News”. 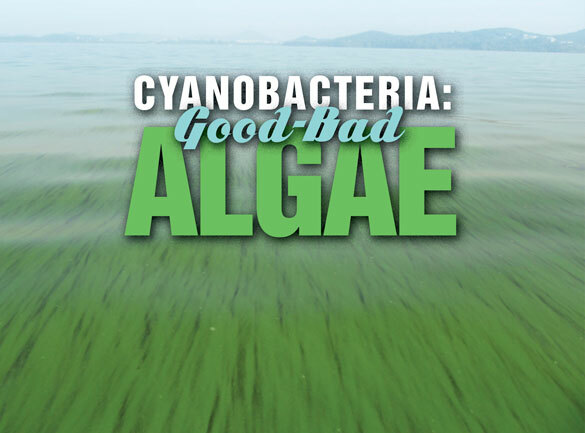 As with many aspects of life, there are good and bad qualities to things that exist in this world, including Cyanobacteria, also known as Algae. In an Aug 27, 2015 article titled “Researchers probe microbes for a future plastics building block” Michael Lauzon writes for Plastics News that “Researchers at the U S Department of Energy’s National Renewable Energy Laboratory (NREL) are tweaking cyanobacteria to produce ethylene through photosynthesis. . . . working with a specific strain . . . that makes ethylene when exposed to sunlight”, this sustainable process (if researchers can get its yields up) could mean that making plastics (ethylene) would also play a role in cutting atmospheric levels of carbon dioxide which is the greenhouse gas that contributes to global warming. It just so happens that Ethylene is one of the chemicals this microbe makes when it converts carbon dioxide to biomass as it grows. I find this exciting !! It may still be another 10 years before this research actually results in semi-commercial farms according to Jianping Yu who heads the research group at Golden CO. Previously, researchers explored a bio-based route to making ethylene from sugar cane or other plant matter. However this approach used lots of water in growing the feedstock plants and had the drawback of tying up land that could be used to grow food for a still growing global population. The new system works in both fresh water and more importantly in seawater, which is available in abundance on this planet. Happily oxygen is one of the byproducts of this cyanobacteria route. It is interesting to note that these ancient microbes are thought to have created most of earth’s oxygen billions of years ago when they were the dominant life form on the planet. The new approach cuts the amount of carbon dioxide emitted into the atmosphere when compared to ethylene production sourced from oil and gas. Using fossil fuels generates between 1.5 and 3 tons of carbon dioxide per ton of ethylene. By contrast, the NREL approach removes 3.4 tons of carbon dioxide because the cyanobacteria capture CO2 from the air in order to perform its photosynthesis. Ethylene production is the highest volume petrochemical made on earth. 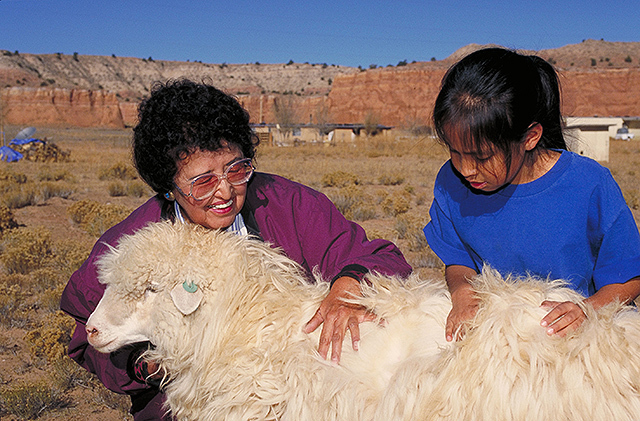 Mealworms are food for many living creatures including humans. Not that I’ve ever eaten them myself but I remember buying some to feed some creature we had responsibility for once upon a time. Mealworms are vegetarians feeding on fresh oats, wheat bran or grain, with sliced potato, carrots, or an apple as a source of moisture. I have seen them in novelty “food products” such as tequila-flavored candies which adds a definite creepiness factor. Mealworms are typically used as a pet food for captive reptiles, fish, and birds. They are also provided to wild birds in bird feeders, particularly during the nesting season. Mealworms are useful for their high protein content and are also used as fishing bait. Now comes news that the plastic foam used for carryout food containers could become a new part of the mealworm’s diet and in the process solve a major garbage problem. It turns out that the larvae of the darkling beetle will actually feed on expanded polystyrene (EPS). The beauty of this is that microorganisms in their guts effectively biodegrade the EPS internally. The end result is that the larvae’s poop from this food source seems to be a safe product that may eventually be suitable as a soil product to grow more plant crops. Researchers at Stanford University in the civil and environmental engineering department headed by professor Craig Criddle and senior researcher Wei-Min Wu in collaboration with colleagues in China have high hopes for its implications “to find a way to remediate current plastic pollution” according to Wei-Min Wu. Researchers at the Beihang University in China had previously observed waxworms, the larvae of Indian mealmoths, break down polyethylene in the form of plastic bags because of microorganisms existing in their guts. The researchers at Stanford and in China plan to study whether the microorganisms in mealworms and other insects could biodegrade other plastics, such as polypropylene, microbeads and bioplastics and they will also begin looking for a marine equivalent of the mealworm. “This is early stage research,” Criddle said. “We don’t know where it will go.” Their research may develop powerful enzymes to degrade plastic or guide manufacturers to design polymers that don’t accumulate in the environment or food chains. Finally, I would like to acknowledge the work of the Vancouver, British Columbia-based organization known as the Plastic Bank which is monetizing plastic waste to reduce litter, especially marine debris, while helping people living in poverty. The organization does this through standard commercial channels but not with the standard commercial emphasis on their own bottom line. Individuals voluntarily pick up discarded plastic from beaches, canals or streets and then take it to a collection center for recycling. The Plastic Bank then pays the center above-market rates for the recyclables — some of which are being ground into flake and injection molded into containers at Plascon Plastics Corp. in Delta, British Columbia, for Lush brand cosmetics. Also based in Vancouver, Lush has a green policy to protect people, animals and the planet in the production of its makeup and toiletries. What’s not to feel GOOD about business that is managed this way ? In Haiti, an individual who turns in their collected items will then be able to get cooking fuel, internet access or cell phone minutes, all items with a real world value. So that in a poverty-stricken pocket of the world plastic is upcycled instead of finding its way into the ocean. Ripples of a cleaner and better world have a significant impact even though it is coming from such a modest undertaking. The co-founders of the Plastic Bank – David Katz and Shaun Frankson – call their recycled feedstock “social plastic”. They are leveraging social media to create demand for their materials. They have a page on Facebook titled “Social Plastic” which now has more than 1 million followers and Twitter users publicly ask major corporations to buy it and to do their part to reduce poverty and plastic waste. A visionary thinker, Katz is a fan of plastic and how it can go from a PET bottle to a T-shirt to a car component. He raves about its versatility and durability. He sees solutions in its ability to change form and be used over and over — if properly handled. This is what Yemm & Hart does as well – take cleaned and ground up milk jugs and detergent bottles and turn them into construction grade panels that can be used to make restroom partitions and countertops. Personally, I have thought of our thick recycled plastic panels like the gold stored in Fort Knox. By keeping it out of the landfill, it remains viable into the future for re-use. 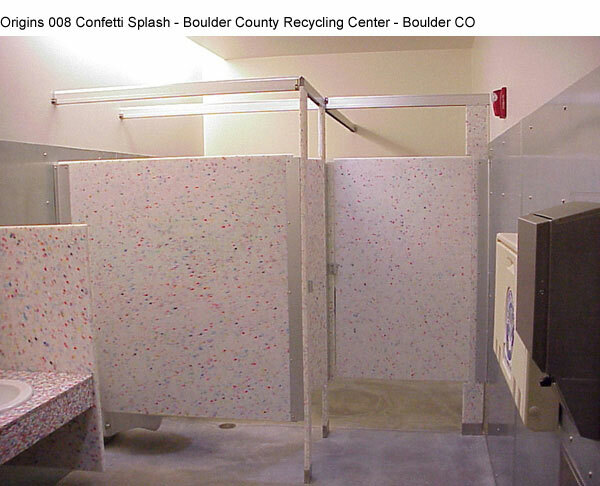 A single 1″ thk panel at 60″ x 120″ typically used to fabricate a restroom partition side wall uses up approx 2,200 containers !! For a long time I have not used the term “global warming” but have preferred to think in terms of “climate change” as a constant of life on earth regardless of whether man’s behavior effects it or not (though I have to believe that human behavior has its effects for I believe that everything is inter-related). 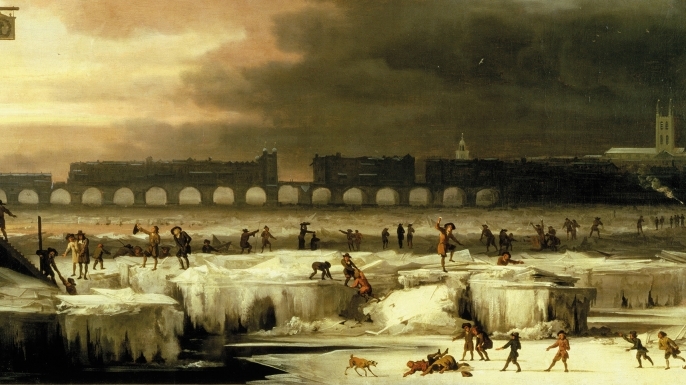 Last Sunday night my family watched a dvd from The History Channel about The Little Ice Age. This is not ancient history lost in the mists of time. 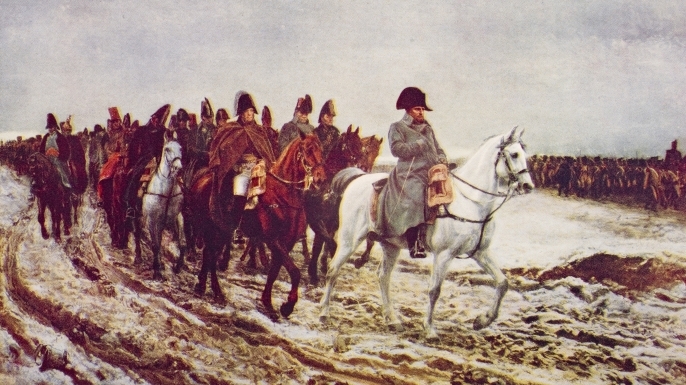 This is history that most of us have learned some portion of in our schooling but I had no idea that sudden and brutal climate change was the underlying factor for so many events that I had other explanations for. I’ve long realized that climate change happens all the time on this planet. I don’t doubt that the behavior of such an overwhelming presence on the planet as human beings are would affect our planet’s overall qualities including its weather related qualities. It was surprising to know that such diverse occurrences as the Irish Potato Famine, which peoples originally migrated into the United States of American and why, the “Black Death” bubonic plague, the fall of the Ming Dynasty with the breach of the Great Wall by Manchurian invaders giving rise to the Qing dynasty in China, the Salem Witch trails and burnings, the French Revolution, Mary Shelly’s Frankenstein book and the deaths of thousands of Napoleon’s troops in the Russian invasion are all effects of a 500 year long “Little Ice Age”. It is staggering to realize that it only took a couple of degrees change to bring it on or how quickly such a “flip” in climate can occur. This is not a rare occurrence in the history of the Earth’s climate. 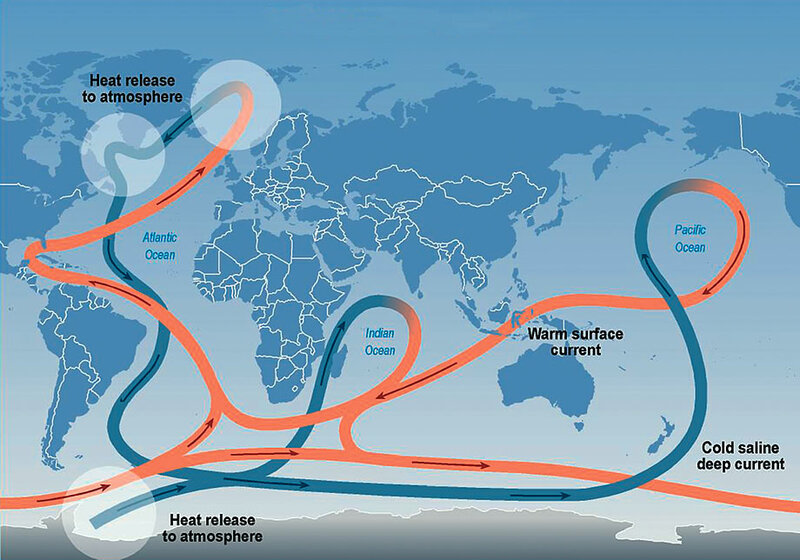 In his article, Thom Hartmann describes The Great Conveyor Belt including the Gulf Stream, undersea rivers that move currents of cold salty water from the Atlantic ocean to the Pacific Ocean. Although much of Europe and Scandinavia are at the same latitude as Alaska and permafrost-locked parts of northern Canada and central Siberia, their climate is more similar to that of the United States than northern Canada or Siberia. That warmth is the result of ocean currents that bring warm surface water up from the equator into northern regions that would otherwise be so cold that even in summer they’d be covered with ice. In the North Atlantic Ocean salty, cool waters settle to the bottom of the sea and then flow south down to and around the southern tip of Africa, where this river finally reaches the Pacific Ocean. The slightly lower level of the Atlantic ocean than the Pacific ocean draws in a strong surface current of warm, fresher water from the Pacific to replace the outflow of the undersea river from the Atlantic. This warmer, fresher water loops around North America where it’s known as the Gulf Stream, and ends up off the coast of Europe. Amazingly, this Great Conveyor Belt is the only thing between comfortable summers and a permanent ice age for Europe and the eastern coast of North America. Only since the 1980s have scientists begun to understand the transition time from icy to warm back to icy. According to Hartmann, in studying ice core samples from Greenland “scientists were shocked to discover that the transitions from ice age-like weather to contemporary-type weather usually took only two or three years. Something was flipping the weather of the planet back and forth with a rapidity that was startling”. These weather patterns are part of a delicately balanced teeter-totter, which can exist in one state or the other, but transits through the middle stage almost overnight. What brings on these sudden shifts are the warm-water currents of the Great Conveyor Belt shutting down. Once the Gulf Stream is no longer flowing, it only takes a year or three for the last of the residual heat held in the North Atlantic Ocean to dissipate into the air over Europe, and then there is no more warmth to moderate the northern latitudes. When the summer stops in the north, the rains also stop around the equator so that at the same time Europe is plunging into an Ice Age, the Middle East and Africa are being ravaged by drought and wind-driven firestorms. This is weather that is NOT for the faint-hearted !!! If the Great Conveyor Belt, which includes the Gulf Stream, were to stop flowing today, the result would be sudden and dramatic. Winter would set in for the eastern half of North America and all of Europe and Siberia, and never go away. Within three years, those regions would become uninhabitable and nearly two billion humans would starve, freeze to death, or have to relocate. Most scientists involved in research on this topic agree that the culprit is global warming, melting the icebergs on Greenland and the Arctic icepack and thus flushing cold, fresh water down into the Greenland Sea from the north. When a critical threshold is reached, the climate will suddenly switch to an ice age that could last minimally 700 or so years, and maximally over 100,000 years. More good news ? The cost of a watt of solar power has dropped from $101 in 1975 to $0.61 in 2015. Global solar power installations have grown from 10,000 in 2009 to 65,000 in 2015. China plans to add 18 gigawatts of solar energy capacity in 2015 alone (just compare that to the TOTAL gigawatt capacity in the US of 20). “Clean Energy” has added 125,000 NEW jobs since 2013. 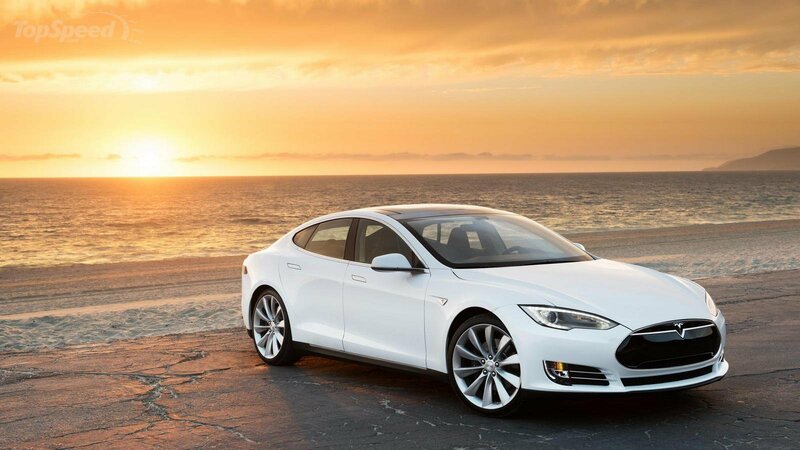 And the number of electric cars has increased from 200,000 in 2012 to 750,000 in 2015. The “Good News” is a long article but well worth reading to avoid despair over the climate change challenges. A link to the full article can be found in the ~ Information Resources at the end of this blog – “The Sunniest Climate-Change Story You’ve Ever Read”. 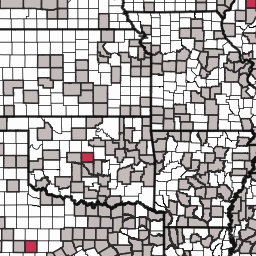 In Missouri’s natural rural forest stands, ash trees only comprise about 3% of total trees. This tree makes up a greater percentage of urban trees – 14% for trees lining residential streets up to 21% in urban parks. Visitors to the state’s parks are reminded not to bring firewood into the state from other states when camping out here and to burn whatever they obtain locally and not take it out of state when they leave. These measures act like a type of quarantine to reduce the likelihood of the insect’s arrival into any state employing similar measures. Tiny Emerald Ash Borers (they are only 1/2″ long or about the diameter of a penny) have killed millions of ash trees since they were discovered in Michigan in 2002. The beetles in their larval form disrupt the flow of nutrients beneath the bark. Over time, they kill the tree. I believe I first became aware about the threat at our Missouri State Fair in 2012. We encourage and support a high degree of diversity for tree planting in our forest as a hedge against any potential insect infestation. In July 2008, a small Emerald Ash Borer infestation was discovered at a Wappapello Lake campground. That discovery put the potential threat in a nearby county to our own forest. Since then, the beetle has been detected in several other areas in the state. Because the insect is a serious problem in states where it has been identified, concerned citizens and officials have looked for all the possible methods they might employ to eradicate the Emerald Ash Borer that is killing ash trees. 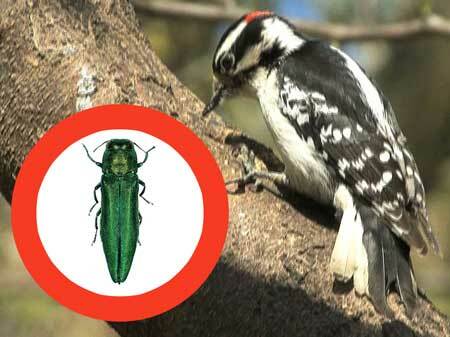 Enter natural enemies of the Emerald Ash Borers. 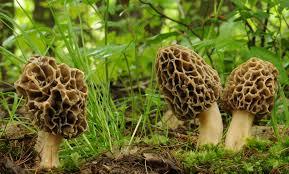 These include predaceous and parasitic insects and insect-pathogenic fungi. With the help of bird-watchers, researchers used information from Cornell University’s Project FeederWatch (for which my late mother in law was a long-time volunteer) and the US Forest Service to identify that the Red-bellied, Hairy and Downy Woodpeckers and the White-breasted Nuthatch populations grew in areas of known Emerald Ash Borer infestations. This was not an impact caused by birds migrating into the area but a result of local birds flourishing and successfully rearing families because they had happily discovered an abundant new food source. Fortunately, BOTH bird species are natives here in our Missouri forest and that is reassuring for our own ability to come through the latest threat with our forest still in a good condition. According to Walter D Koenig from Cornell’s Lab of Ornithology, the birds “can depredate quite a surprisingly high percentage of Emerald Ash Borer larvae in some forests” but that “It’s unlikely that this would be enough to stop the invasion, but it could certainly slow it down, at least in some areas.” We should not discount the tenacity of the most predaceous species on our planet, human beings, to continue to look for every way possible to turn back the tide of the latest invasive species to drawn our concern. The arthropod predators of insects and mites include beetles, true bugs, lacewings, flies, midges, spiders, wasps, and predatory mites. Insect predators can be found throughout plants, including the parts below ground, as well as in nearby shrubs and trees. Some predators are specialized in their choice of prey, others are generalists. Some are extremely useful natural enemies of insect pests. Unfortunately, some prey on other beneficial insects as well as pests. Insect predators can be found in almost all agricultural and natural habitats. Each group may have a different life cycle and habits. Although the life history of some common predators is well studied, information on the biology and relative importance of many predatory species is lacking. While research has found that commercial chemicals can be effective in controlling emerald ash borer infestations, “you just can’t afford to do that in the woods,” said Andrea Diss-Torrance, a forest entomologist with the Wisconsin Department of Natural Resources. And some of us (this blog’s author and her husband definitely included !!) PREFER NOT to use chemicals on our land. Two kinds of wasps are being used that will insert their egg-laying appendage through the bark and lay eggs in tunnels on, or in, emerald ash borer larvae. Once the eggs become larvae, they will eat the larvae of the beetle, Diss-Torrance said. Another species of wasps released at a different point in the seasonal cycle lay their eggs on or inside the eggs of the emerald ash borers when they are laying their eggs on the bark of ash trees. Once the larvae develop, they will eat emerald ash borer eggs. Sometimes, biological controls have interesting consequences. We have experienced the swarming of Asian lady beetles that will crawl into crevices of homes and that look alot like a native ladybug. These are believed to have first arrived in the United States in 1916. Southern farmers reintroduced them in the 1980s to control pecan aphids. We once captured the lady bugs emerging indoors here in Springtime and relocated them to a treasured replanted live Christmas tree that had developed an aphid infestation. The wasps are reared in a US Animal and Plant Health Inspection Service laboratory in Brighton, Mich. To date, 180,000 wasps have been released in nine other states, including Michigan, Illinois and Minnesota under permits granted by the inspection service, an arm of the U.S. Department of Agriculture. The first wasps used in a field trial were in Michigan in July 2007. Tiny wasps have been used to control gypsy moth populations. The Potawatomi Indians of Michigan have been on the front lines of the battle against the Emerald Ash Borer. Their native tradition includes making a cultural style of basket from Black Ash trees. For generations the Potawatomi Indians have used wood from Black Ash trees to weave baskets, teaching the skill to their young. For the tribe there is much more at stake than a side source of income. 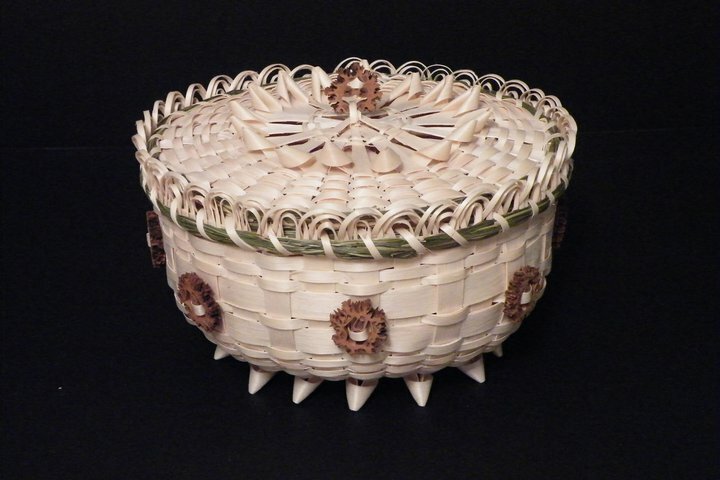 “Baskets made from Black Ash played a huge role in our tribe’s life and history. Back then, the baskets were like money. You traded for it, and got the things your needed to care for your family” says Jamie Brown a part-time basket weaver who is part Potawatomi. She learned basket making from her parents. Her mother learned the skill from her uncle. So there are at least three generations of her family that have made these baskets. She adds that “It’s part of who we are. It’s cool to carry on the tradition and share it with the next generation.” The USDA Forest Service research team has discovered that the Potawatomi Indian’s traditional method of storing Black Ash logs by submerging them in rivers can effectively preserve the logs for basketmaking while simultaneously KILLING the Emerald Ash Borer larvae lurking under the bark which then prevents the emergence of adult beetles in spring. A study concluded that submerging the logs for 18 weeks during winter or 14 weeks in spring killed the insects and retained the wood’s quality for basketmaking. Thus the arrival of the insect onto their lands was taken quite seriously by the tribe. 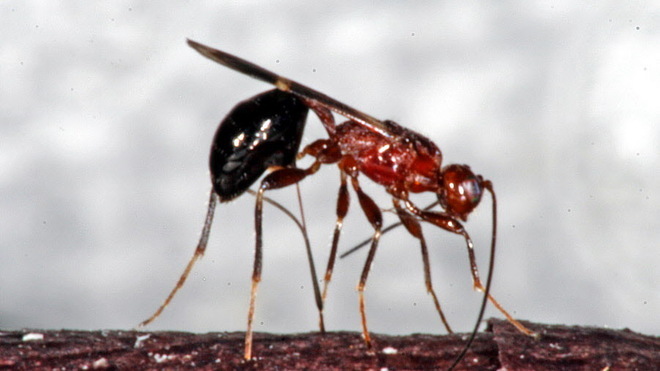 While the Pokagon Band of the Potawatomi tribe has used insecticide on its trees in the Hartford and Dowagiac regions, they are participating in the introduction of wasps as predators in their battle against the decimation of their ash trees by the Emerald Ash Borer. There are many potentially invasive insects listed at the Missouri Dept of Conservation’s page for the Emerald Ash Borer. Interestingly, they are all types of beetles from Asian Longhorn to June Bugs to Lady Beetles and more. A healthy and diverse forest with a healthy and diverse wildlife contingent will help any forest to survive the occasional arrival of undesirable insect guests. 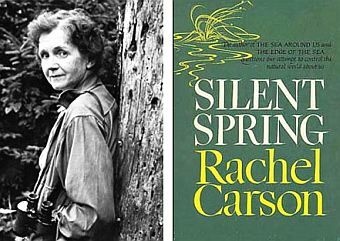 As Rachel Carson pointed out repeatedly, graphically and so very well in her 1962 book Silent Spring – natural deterents to such threats are the best approach and chemicals should be used only sparingly or not at all because any lethal chemical will have impacts beyond the intended targets. We have noted that after a large swarming of Lady Beetles here that over the years the quantity has naturally diminished to a point where their presence is less disagreeable. Just like the weather, insects have natural cycles that will seek balance with their environment over time. Often too, the role of the beneficial predators has not been adequately studied. The use of chemicals is motivated by profits and easy availability. However, surveys of agricultural systems give an indication of the potential number and diversity of predators in a crop. For example, over 600 species of predators in 45 families of insects and 23 families of spiders and mites have been recorded in Arkansas cotton. Eighteen species of predatory insects (not including spiders and mites) have been found in potatoes in the northeastern United States. There may be thousands of predators per acre, in addition to many parasitoids. Although the impact of any one species of natural enemy may be minor, the combined impact of predators, parasitoids, and insect pathogens can be considerable. Sometimes it is embarrassing to be associated with an industry such as the Plastics industry. Even though what we do is environmentally friendly (keeping already existing plastics out of the landfill) and the plastics that we are dealing with HDPE, LDPE and PP “seem” relatively benign. However, it does not appear that we can trust any assurances from the chemical industry. The Huffington Post has a damning article titled “Welcome to Beautiful Parkersburg, West Virginia” by Mariah Blake (see Information Resources at the end of this blog for a link). It is a saga yet to reach it’s conclusion. It is the story of the Washington Works, a plant in the DuPont family of companies and the Dry Run Creek landfill. It is the story of intentional deception on the part of DuPont. 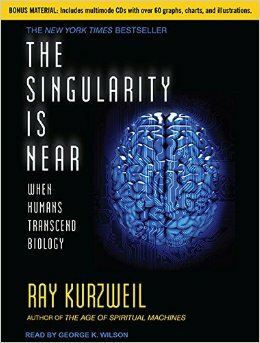 It is the story of how our modern day conveniences and ease in living are often obtained through the horrendous suffering of everyday people while the corporation – inherently different from a small business where someone actually cares and there is a “buck stops here” sense of responsibility – grows enormously wealthy and seeks to shed any liability for its actions in doing so. DuPont assured the family on who’s farm it wanted to obtain a landfill that it would only dispose of non-toxic material like ash and scrap metal. 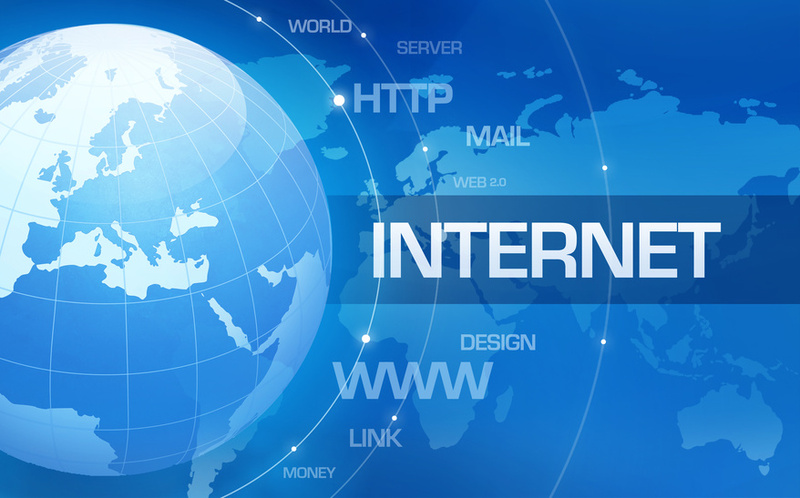 It is easy for me to believe that with large corporations the left hand may not know what the right hand is doing. That the person making these assurances believed them. That whoever was responsible for supervising the transport and disposal of toxic substances in that landfill may have known nothing about such assurances. This is one of the more troubling aspects of corporations – no direct human responsibility as the corporation is a non-human entity – even though human beings are employed by it. I know it has long been troubling for me to see the Teflon (or its more recent similarly structured derivatives) non-stick coating on my electric kettle and skillet flake off and I’ve not felt entirely reassured that it is safe and inert. There seems to be a good reason for my reluctance and distrust of the chemical industry in general. Thankfully, the last electric skillet I purchased has what appears to be a very durable surface that does not flake off, although it may subtly disintegrate imperceptibly over time. There is no way for me to be certain. The histories of our various chemical giants like DuPont, 3M, Monsanto and Union Carbide just to name some of the more recognizable is littered with enough worrisome behavior as to justify a degree of bad karma for these businesses. After congressional hearings in 1934, DuPont (who had “supplied half of the world’s gunpowder and was expanding into bombs and poison gas. But it was drawing fire on the home front”) was advised that “the only way DuPont could escape the ‘atmosphere of plague’,” was to “transform its image from that of a purveyor of doomsday weaponry to a maker of peacetime products that benefited American society”. Thus was born the “Better Things for Better Living … Through Chemistry” blueprint for the future. 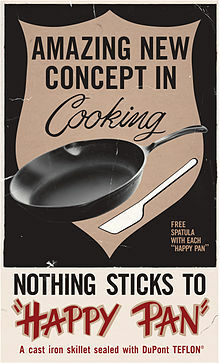 “Through the marvels of science, synthetic materials would free people from mundane tasks, allowing them to lead lives of leisure and ease.” DuPont’s legacy with Teflon traces itself back to its use in coating “the valves and seals of the Manhattan Project’s uranium enrichment equipment”. 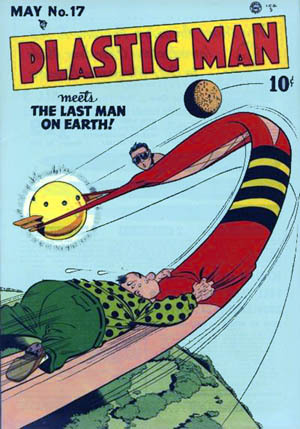 There was also created the idea of The Plastic Man in the late 1940s. “This fortunate being would enter a world of ‘color and bright shining surfaces, where childish hands find nothing to break … no crevices to harbour dirt or germs’. He would live his life ‘surrounded on every side by this tough, safe, clean material which human thought has created’.” There was even a comic book series of that name. 3M was long the supplier of C8 (perfluorooctanoic acid) to DuPont. C8 is a soaplike substance that gives Teflon its nonstick qualities. It is also found in thousands of household products, including carpeting, waterproof clothes, dental floss, kitty litter and cosmetics to name a few. Only in May 2000 did 3M annouce that it would phase out a close relative of C8 called perfluorooctane sulfonate, or PFOS used in Scotchgard fabric protector. Over the decades, DuPont has dumped huge quantities of Teflon waste into the ocean and into unlined pits along the Ohio River. 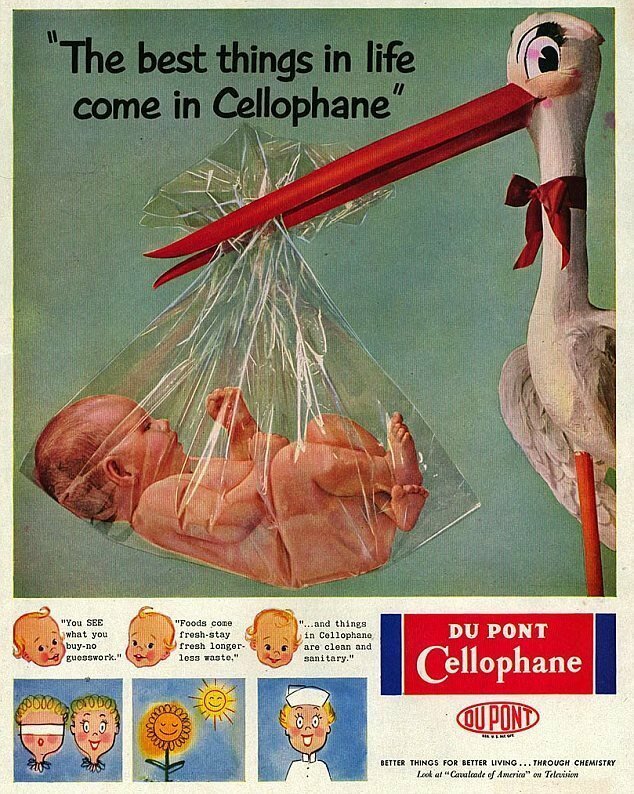 When 3M began shutting down its C8 production, DuPont began manufacturing the chemical itself. DuPont was involved in “another cover-up involving a grease-repellant chemical called Zonyl that is used in candy wrappers, pizza boxes and countless other food containers. DuPont had long insisted that the substance didn’t migrate into the food, but internal documents showed that it seeped off packaging at levels three times higher than what the FDA regarded as safe—and then broke down into C8”. C8 has been detected everywhere. In produce and beef in American grocery stores, polar bears in the Arctic, even children in the remote Faeroe Islands. One analysis of blood banks from around the world showed that nearly all of the blood contained C8. Monsanto claims that they are a relatively new company even though they share the name and history of a company that was founded in 1901. Monsanto can claim credit for Saccharin used in 1902 by Coca-Cola. In 1929, Monsanto became the largest producer of polychlorinated biphenyls (PCBs), which were later banned in the 1970s. They remain to this day they in the water along Dead Creek in Sauget, IL (just across the Mississippi River from St Louis, MO where Monsanto is headquartered) where Monsanto had its plant for manufacturing PCBs. By 1938 Monsanto was largely involved in the plastics business. And from 1939 to 1945 Monsanto did a lot of research on enriching uranium for Manhattan project. During WWII, Monsanto was involved in the production of PCBs, DDT and chemical weapons. From 1961 to 1971 Monsanto was involved in the production of Agent Orange which was sprayed on the Vietnamese civilians and American troops during the Vietnam War. No wonder they wish to distance themselves from the “old” company !! It can be disconcerting to learn that under the final version of the Toxic Substances Control Act of 1976 existing chemicals are all “grandfathered” in. Only five chemicals have ever been banned under the Toxic Substances Control Act. This means that only a handful of the 80,000-plus chemicals on the market have ever been tested for safety. Manufacturers are required to “inform” the EPA when they introduce new chemicals; however, no testing of such chemicals is required. This regulatory regime still exists today. “We are all, in effect, guinea pigs in a vast, haphazard chemistry experiment.” Since the Toxic Substances Control Act makes it extremely difficult for the EPA to ban chemicals, the best the EPA could do was negotiate with DuPont for a voluntary phase-out by 2015. I am grateful that Missouri appears to be free of drinking water PFC contamination in the counties that have been tested for it. Our county has not been tested but it is reassuring to know that it is unlikely that we have any concerns related to this particular substance being in our drinking water though larger concerns remain due to C8 being already generally pervasive throughout modern society. You can check your location at the Environmental Working Groups interactive map – PFC Contamination. When in the course of human events, intentional actions bring unintended consequences, it may be intelligent to notice that there exists an imbalance that needs adjustment. 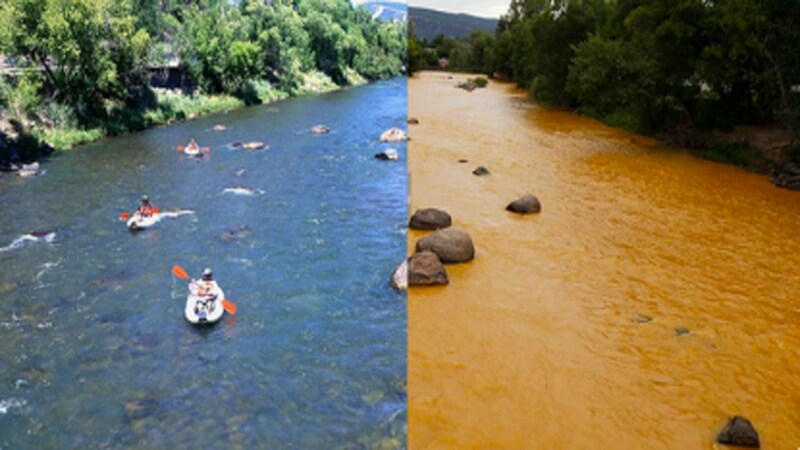 Therefore I did appreciate an editorial that was posted in the NY Times online Aug 20, 2015 “When a River Runs Orange” by Gwen Lachelt. 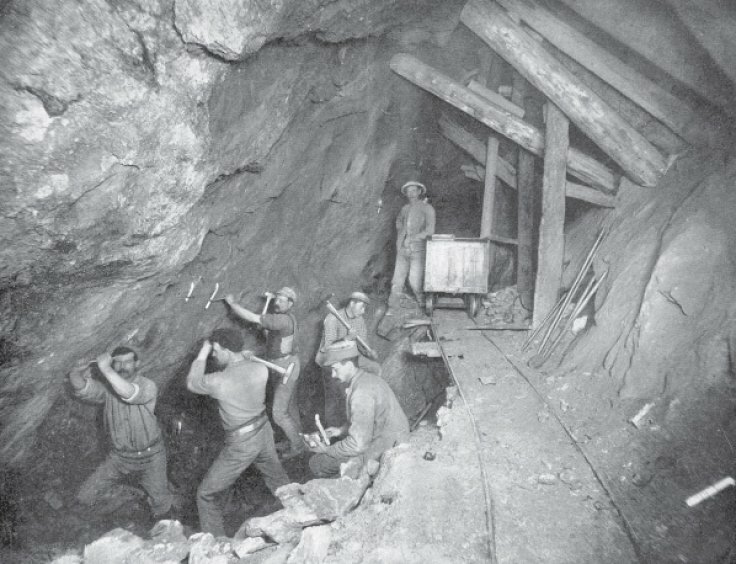 This article makes the point that mining laws placed on the books back in 1872 are still in effect and having an impact on the circumstances related to abandoned mining operations in the United States. EarthWorks has a lot of information on the General Mining Law of 1872 and the need for reform. They note that it was signed into law by President Ulysses S Grant and that the mining law allows “mining interests to take valuable hardrock minerals including gold, silver, and uranium from public lands without royalty payment to the taxpayer unlike other mining industries that extract coal, oil or natural gas” and “to buy valuable mineral bearing public lands for no more than $5 per acre” which was the price set in 1872 and which has never been adjusted for inflation. The fact is that “19th century America wasn’t concerned with environmental protection. So the mining law doesn’t contain environmental protection provisions”. So why do we at Yemm & Hart care ? – apart from having environmentalist’s hearts in general. It is because we live and work in an area that has been contaminated by mining practices in the past. My region of Missouri was historically and heavily influenced by early lead mining and later on in more recent times cobalt mining as well. Mining here has left large tracts of “wasteland” locally. 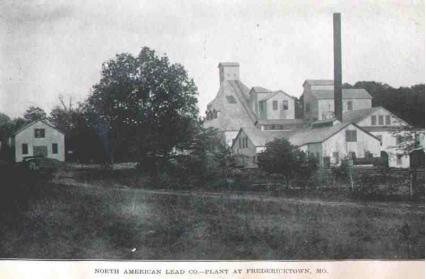 Lead mining in our region dates back to the very first French settlers before there was even a General Mining Law of 1872. The sad truth is that mining practices in our region resulted in us becoming “known” as a EPA SuperFund Site identified as the Missouri Mines Site. Before the local population knew “better” tailings from the mines were often used on residential yards, in sidewalk construction and on driveways. Children in the area have been widely tested for lead exposure and remediation has been accomplished locally by digging up yards and replacing top soil. It is interesting to note that my husband comes from a long family line of coal miners beginning in the Gloucestershire area of the UK and immigrating into the coal fields of Illinois and Indiana in the US. Eventually, his family worked their way out of the mines and into other occupations but it is still interesting to note that we ended up on a farm in the Lead Belt mining region of Missouri – although thankfully there were no direct mining activities here on our land or anywhere nearby.